Everyone wants to be in better shape. Even those folks that are already super buff have a continuing drive to further enhance their physical fitness. One of the best ways to help make this happen is to adopt a workout routine that is readily available to you and that meets your needs. 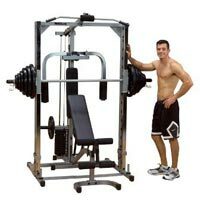 There are several ways to make this happen: you can simply go with resistance training or isometrics using your own body to work on your fitness, you can purchase a gym membership and make it a point to set aside time at a local gym every evening, or you can purchase various home gym machines to get your workout going. Before deciding which of these options to pursue, you need to evaluate a couple of points. One of the first points you need to consider is how much you will use the machine, honestly. When going through this evaluation it is important to be honest with yourself. Know your limitations, and keep your expectations realistic. If you have nothing but time to work out all day long, then you can choose all three of the options listed above. However, most folks reading this article will not have unlimited time to work on body sculpting. Figure out what kind of time you have in your schedule and see if you have time to spend an hour, two hours, or maybe only thirty minutes to reach your fitness goals. Once you have identified this constraint you can honestly evaluate if you need to work out at home or if there are home gym machines available that will help you reach your goal. Cost is important to most people. Remember though, when determining the type of work out routine that will offer you maximum benefits you must not only consider the actual cost of the gym machine or gym membership, but also the time associated with traveling to your workout area (if using a gym membership) and your return on investment for the dollars spent. Part of this is tied back into the first point. If you spend one thousand dollars on a home gym machine and only use it five times, you paid $200 for each workout. This is one of the reasons discount home gyms and used home gyms are very popular. Instead of spending money to buy a brand new piece of equipment, it may be a better idea to spend less money on a used fitness machine first to check your drive. If you are considering a gym membership, maybe you can find a gym that will allow you to buy a handful of classes to give it a try before signing up for a long term membership. Both of these options will save you money in the long run. Take the time up front to evaluate your exercise needs. An honest evaluation of what you really need will help save you considerable money and frustration.